« Tonight at Mercury Lounge – Robbers On High Street! News :: Sneak Peak: The Bloodsugars’ new music videos! Last month The Bloodsugars traveled down to Savannah College of Art and Design in Savannah, GA to film not one, but two music videos for songs off of “I Can’t Go On, I’ll Go On.” The videos won’t be done until September but check out some behind the scenes footage below. And mega huge thanks to everyone down at SCAD who made this happen!!!! The Bloodsugars – Behind the Scenes from Zach Graber on Vimeo. News :: Tonight at Mercury Lounge – Robbers On High Street! 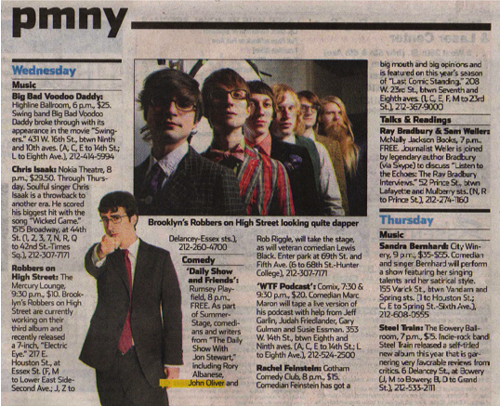 As seen in today’s AMNY (see below), at 10:30pm tonight (July 21st) Robbers On High Street will take the stage at the legendary Mercury Lounge in NYC’s Lower East Side. Playing right before is Hymns, who we just saw play a great set opening for Tracy Bonham’s CD release show at Joe’s Pub. The show is 21+ and tickets are $10. And WNYC previewed the show too and posted a free download which you can check out here. Last week Luke Wesley celebrated the release of his debut album Because We Never Talk About It at the new Stage 2 of Rockwood Music Hall to a packed house. Here’s a video of Luke with special guest Mike Grubbs from the band Wakey! Wakey! covering The Pixies’ Here Comes Your Man. Tags: luke wesley, Mike Grubbs, Rockwood Music Hall, Wakey! Wakey! 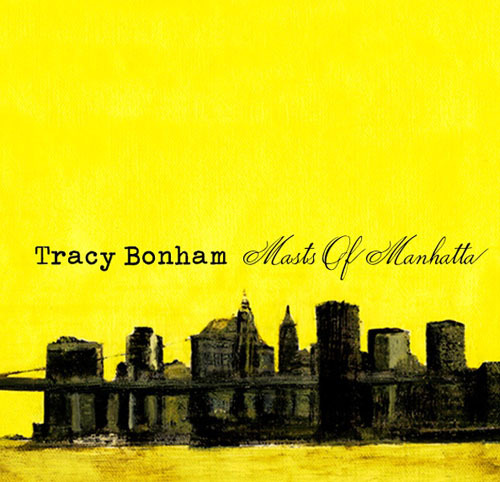 News :: New Release: Tracy Bonham’s “Masts Of Manhatta” Out Today! After a great performance on The Tonight Show last night today is the day Tracy’s new album is now available in stores. Produced by Tracy herself, “Masts Of Manhatta” was then mixed by Tchad Blake (Tom Waits, Los Lobos, Lisa Germano) and also features the Brooklyn-based Smokey’s Roundup, a trio led by guitarist Smokey Hormel (Tom Waits, Beck, Norah Jones), as the backing band. Come celebrate with us tonight at Joe’s Pub, show starts at 9:30pm with The Hymns opening. 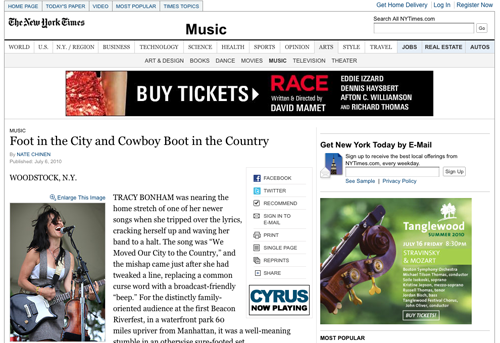 Over the weekend the New York Times printed a lovely article on Tracy and her new record in the Arts & Leisure section, but you can read the full article online as well right here. And if you’ll be zipping around the city in a yellow cab this week (and by zipping I mean sitting in traffic while the cabbie talks obnoxiously into his cellphone) keep the TV turned on and you’ll catch Tracy being interviewed on NBC’s Talk Stoop with Cat Greenleaf….or watch it here (much cheaper and also comes without the risk of serious bodily injury). And tonight’s the night, catch Tracy performing “Big Red Heart” on The Tonight Show with Jay Leno! 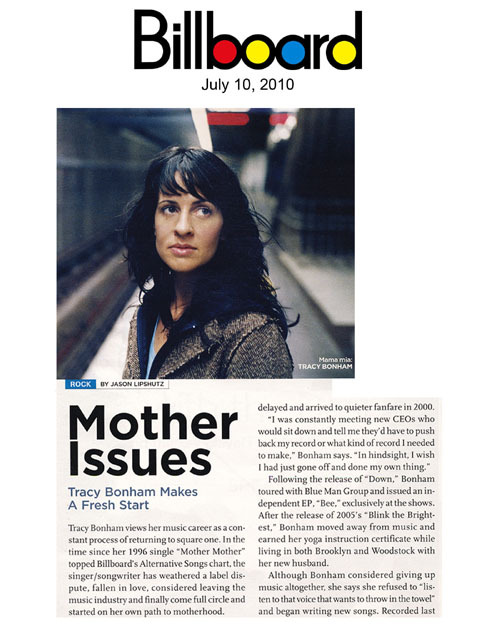 News :: Tracy Bonham is EVERYWHERE! Okay maybe not everywhere everywhere but out there plenty. This week we heard that she’ll be performing a song off of the new album on The Tonight Show with Jay Leno!! The show airs this Monday July 12th so make sure you tune in to NBC at 11:35pm est to catch it. Then if you pick up the newest Rolling Stone Magazine you’ll find a great review of “Masts of Manhatta” in there. And last but not least Billboard ran a feature on Tracy this week! Read the full article online here.